NOTE: This fix does not work on Windows 10 Home. OneDrive (previously SkyDrive, Windows Live SkyDrive and Windows Live Folders) is a personal cloud file hosting, storage and sync service from Microsoft. In Windows 10, the OneDrive desktop app is installed and comes natively with the operating system. And if you sign into Windows 10 with a Microsoft Account (MSA), OneDrive is also enabled by default. However, not everyone uses OneDrive. Some may prefer other similar cloud storage services such as Dropbox, Google Drive, Apple iCloud Drive, Box and many more. Or many may simply not using any cloud storage service or file hosting service at all, especially at computers used in businesses, corporations, enterprises, schools and educational institutions. Unlike Windows 8.1, Windows 8, Windows 7 or earlier Windows operating systems, OneDrive desktop app is tightly integrated with Windows 10. OneDrive folder is in File Explorer’s navigation pane right from the moment you starting to use Windows 10. In fact, by default Windows 10 does not provide a way for users to uninstall and remove OneDrive app, whether it’s from “Programs and Features” of “Control Panel” or Windows Store. You simply won’t find any OneDrive entry to initiate the uninstallation process. However, there are several ways available in Windows 10 to deal with OneDrive app, depending on whether you want to hide, disable, remove or uninstall the OneDrive. The tutorial provides all the options available with step-by-step guide. Beginning from Windows 10 Creators Update Version 1703 (or more specifically beginning from Windows 10 Build 14986), OneDrive is showing as a standalone app in Apps & features section of Settings and Programs & Features section of Control Panel, and hence, could be uninstalled via official uninstaller. Here’s how to uninstall OneDrive via Settings or Control Panel. Do note that Windows 10 may still have some remnants of OneDrive such as shortcuts after removal. Press Win + R keyboard accelerator to open Run dialog box. Type GPedit.msc and hit Enter or OK to open Local Group Policy Editor. Navigate to Local Computer Policy -> Computer Configuration -> Administrative Templates -> WindowsComponents -> OneDrive. 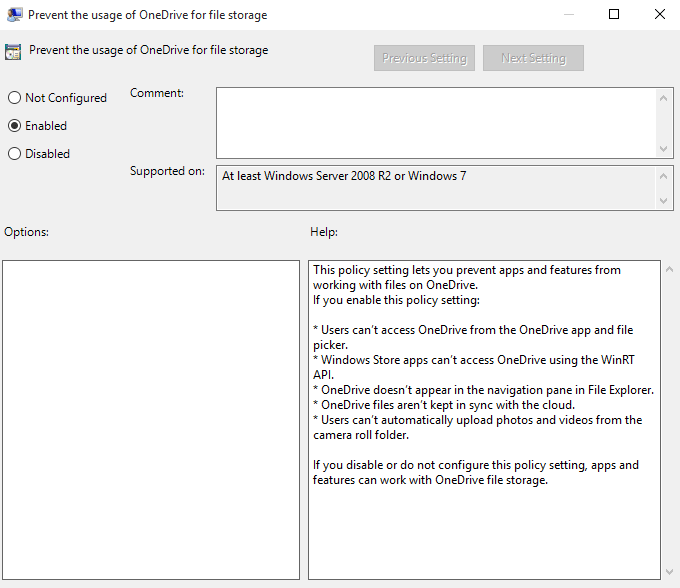 In the right pane, double click on policy named Prevent the usage of OneDrive for file storage. Click or tap OK when done. Can’t access OneDrive from the OneDrive app and file picker. Windows Store apps can’t access OneDrive using the WinRT API. OneDrive doesn’t appear in the navigation pane in File Explorer. OneDrive files aren’t kept in sync with the cloud. Can’t automatically upload photos and videos from the camera roll folder. Sign out and sign in again, or restart the computer. Type RegEdit.exe and hit Enter or OK to open Registry Editor. Right click on Windows and select New -> Key. Name the new key as OneDrive.Note: If OneDrive key already exists, skip this step. Set the data for DisableFileSyncNGSC registry value as 1. Note: DisableFileSync registry value only works in Windows 7, Windows 8 and Windows 8.1 and does not work in Windows 10. If you just want to remove the OneDrive entry in the navigation pane (also known as side panel or folder tree) in the File Explorer, or the OneDrive folder still exists in File Explorer after disabling OneDrive, follow the guide to remove OneDrive from Windows 10 File Explorer Navigation Side Panel. It’s impossible to manually uninstall and remove OneDrive in Windows 10 by the step-by-step guide below. Run the commands to be executed in the process below in an Administrator Command Prompt. One you ran the above command, OneDrive desktop app is uninstalled completely and cleanly. Most of the time, no progress bar nor confirmation dialog is shown. However, when you search for OneDrive, the app no longer be found. Make sure that the following folders no longer contain any user data before proceeding with the following commands. OneDrive has registry keys which add itself to the Navigation Pane of File Explorer in Windows 10. After uninstalling OneDrive, these registry keys are orphaned, and can be removed. I’ve repeatedly taken steps like this over the past several updates where Microsoft reinstalled OneDrive against my wishes, which always mostly worked. For some reason, the OneDrive item is still showing in the explorer locations this time. Also would you have any idea how to get rid of it in the default “save (as)” interface where it has persistently remained? This fix should remove all remaining persistent OneDrive elements from your PC. Not sure why yours is being re-installed by Microsoft. Is this happening with Microsoft update? Also, have you tried Googling for the answer? If you find something be sure to post it here. I will also look. Thanks. I think it happened with the anniversary and creator’s updates, but I can’t say for certain. As it is, the app itself is gone, so is the mention of it in the quick access in file explorer, but it still shows in the “save as” window. Actually, apparently between the last post and now, it has seemed to have disappeared even from there, so please disregard my inquiry.